All 18 Qatar Airways coupons have been verified and tested today! No need to play the impossible game of choosing what you must go without on your trip. Over-packers rejoice-- Qatar Airways offers generous baggage allowance. Most allowances account for 2 pieces that do not exceed 50 pounds (and in some cases 70 pounds depending on your destination). Please note: excess baggage charges may apply if you exceed the weight and/or piece allowances. For a more detailed look at baggage allowance guidelines, visit the Qatar Airways website, click on Journey on the main menu, then select Baggage. If you are a Qatar Airlines member, you can earn bonus Qmiles when you book online. Plus, when you make your first ever purchase with Qatar Airlines, you will earn 2,000 miles. You can even earn 500 bonus Qmiles for each following online booking. There is no limit to the number of bonus Qmiles you can earn and they will be credited to your account once your flight purchase has been completed. So go ahead; book online and start earning Qmiles today! Please note: family members are not eligible for online booking bonus Qmiles. Be the first to receive exclusive offers (sometimes even a Qatar Airways coupon) and the latest news on products and services. It all comes directly to your inbox, meaning you’ll never miss out. So make sure to keep your eyes peeled for a Qatar Airways coupon in your inbox every now and then. Plus, no worries if you change your mind, you can always unsubscribe at any time via the link provided in the newsletter. Follow along with Qatar Airways on Instagram (@qatarairways), Facebook (Qatar Airways), and Twitter (@qatarairways) for updates, a chance to receive a Qatar Airways coupon code, travel inspiration, hotel and rental recommendations, and much more. Social media is a great way to stay connected and get alerts for more ways to save. Another great way to save is to simply visit Qatarairways.com regularly to see what deals and promotions are currently available. 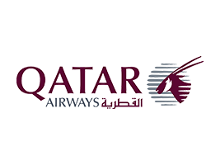 Although the airline provides many automatic deals, they also sometimes provide deals that include a Qatar Airways coupon code. As a Privilege Club member, you enjoy exclusive benefits that make traveling Qatar Airways even more rewarding. Every week Qatar Airways features several limited time offer deals of the week. Destinations change every week and prices can’t be beaten (sometimes as low as $700). There you have it. Get in on a deal this week! It’s as simple as that. Now go find yourself a Qatar Airways promo code and get started on your journey.